It was a gift of baby shower games. All the guest, I liked it, the comment was a nice and useful gift. Was very pleased with the size, quality and packaging of this item. Can't wait to give them out at the shower. I think this item could also be used as an ornament. Thank you Beau-Coup! The guests love the bookmark!!! Gave a star to each guest who attended the baby shower. Q:Is the star hang tag on the outside of the box or on the inside of the box? What are the words on the star? A:The star tag hangs on the outside of the box and reads "a star is born! bookmark signet". 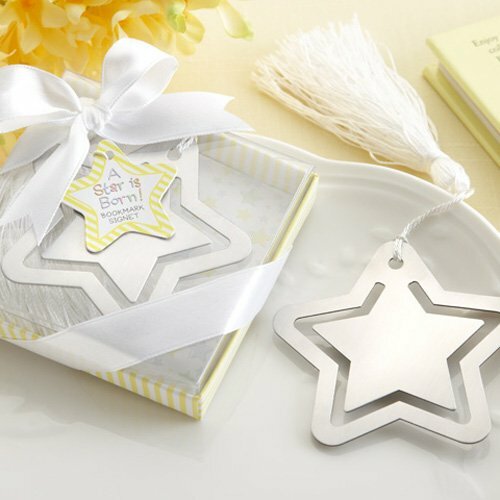 Celebrate the arrival of your little star with these bookmark favors. Your baby shower guests will love these star-shaped bookmarks, and will think of you and your family every time they reach for a new book! Each die-cut star is made of metal and comes with an attached silk tassel to help you find your page even when the book is closed. Bookmarks arrive individually packaged in a clear-topped display box, ready to give out as guest favors.